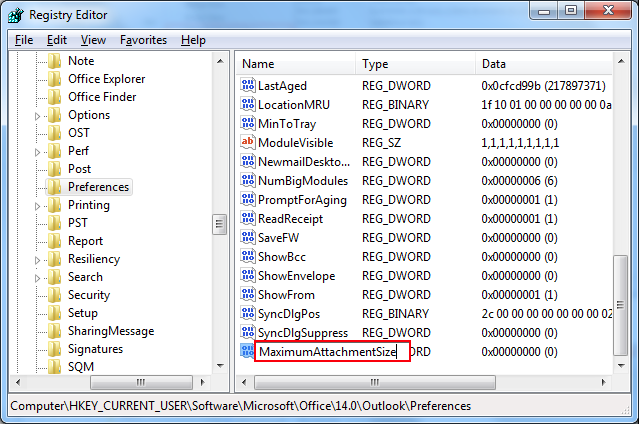 Explore How To Increase The Outlook Attachment Size Limit? Not everyone is aware of the fact that Outlook imposes a certain limit on the size of the attachments that are being sent. But, when the attachments exceed the predefined limit, the realization spans over. Basically the attachment size limit is defined by the server configuration that you are using. 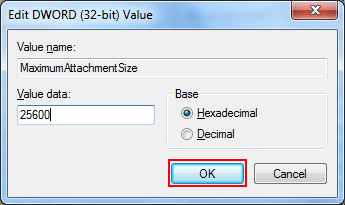 The maximum attachment size that a user can send is 20 MB by default. 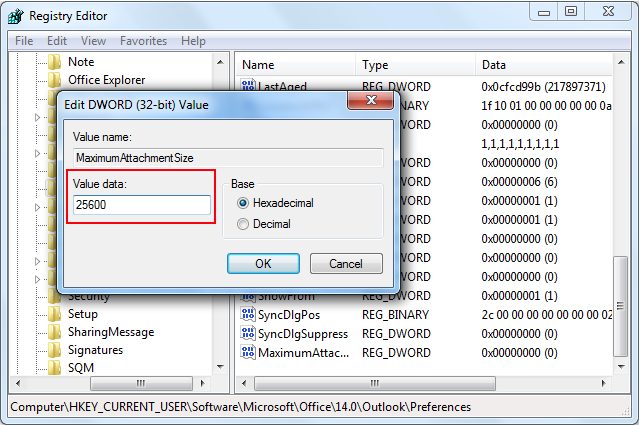 Outlook 2010 is equipped with a built-in warning system in order to warn the users when they try to send a large attachment. When an attachment is added that goes over the maximum size limit, an error message is generated in order to prevent the user from adding the attachments. Also, the given below warning message prevents the messages from getting stuck in the Outbox. 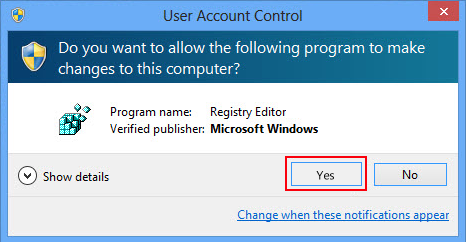 If your Internet Service Provider allows you to make changes and increase or decrease the size of the messages and you desire Outlook to match this limit, you can take the assistance of Registry Editor to do so. In case you are using Exchange server, then there is no requirement to make any changes as Exchange automatically lets Outlook know about the limit. You can follow the given mentioned steps to make the changes in the size of the attachments via Registry editor. In the search field type regedit. Click Yes in the run box. Double click on the value MaximumAttachmentSize. If this value does not exist, then go to Edit option. 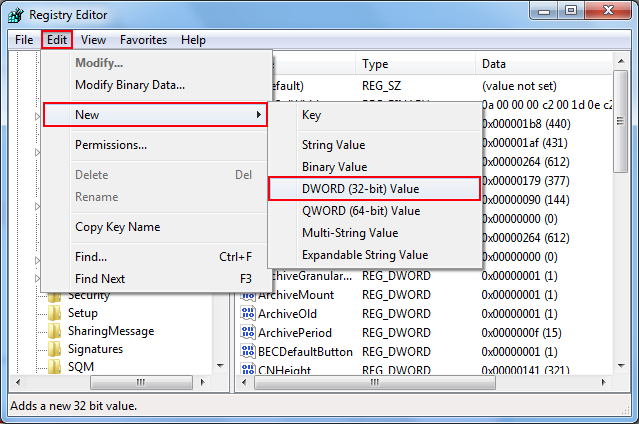 Select New and click on DWORD Value. Rename the value as MaximumAttachmentSize. Double click on this MaximumAttachmentSize value. In the box under Value Data enter the desired attachment size limit in KB. For example, if you want the maximum limit to be 25 MB, then make sure to enter 25600 in the value data box. If you do not wish to impose any limit, then in the value data box you can enter 0. Although it is recommended not to do so as all the mail servers have a certain limit. 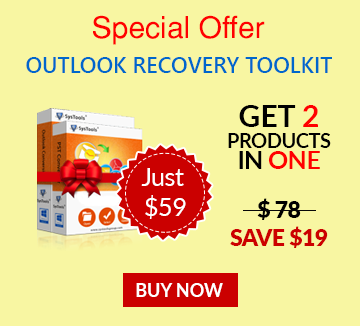 Note: It is to be noted that the above method is applicable for Outlook 2010 and Outlook 2013 versions and not for Outlook 2007 and below versions. 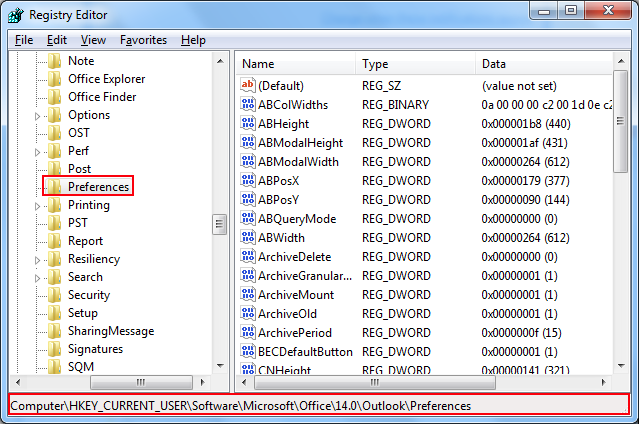 By making changes in the registry editor, one can make changes in the maximum size limit of Outlook attachments.The user can select a desired limit as the maximum limit of the attachments that can be sent without putting messages in waiting in Outbox folder and also to avoid error messages.